The material in this webpage is culled from Selection of Questions and Answers: April 1999 (Part 2). Could you also exemplify Tai Chi Chuan exponents who solely practiced Tai Chi Chuan and could fight effectively in the past. Two modern examples are Wu Gong Yi and Wong Seng Yen. In the 1940s or 50s in Hong Kong, some martial artists from White Crane Kungfu commented that Tai Chi Chuan could not be used for fighting. Subsequently a public match, with the proceedings going to charity, was arranged between the Wu Style Tai Chi Chuan master Wu Gong Yi and the White Crane master, who was well known for his fighting ability and also much younger than the Tai Chi Chuan master. It was a much publicized fight. When blood was flowing profusely from the White Ctane Master's face, the referee stopped the match and declared it a draw. It was a tribute to both sides that they gracefully accepted the referree's wise decision, and remained friendly. The Malaysia Taijiquan master, Sifu Wong Seng Yen, bouncing off his opponent, an international wrestling champion, in a public match. This picture is reproduced from an old kungfu magazine which reported the match. In the 1950s in Singapore a duel was arranged between a Malaysian Tai Chi Chuan master Wong Seng Yen and a Singaporean international wrestling champion. The wrestler was in his prime age, whereas Wong Sen Yen was in his 50s. It was a serious duel. Both combatants signed an agreement that should there be injury or death, no one would be held responsible. But the match was to be conducted with a referee and umpires awarding points. Wong Seng Yen went round visiting his old friends telling them it might be the last time he saw them. 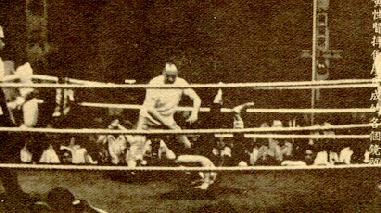 In the match Wong Seng Yen, using purely Tai Chi Chuan techniques and tactics, easily threw the wrestler about. I could not remember the exact points, but they were something like 359 to 0. The wrestler could not even score a single point! Manifesting the qualities of a great master he was, Wong Seng Yen did not hurt the wrestler, he merely bounced him off; a lesser fighter would have smashed the wrestler's head or at least broken some of his bones. Sifu Wong Seng Yen and Sifu Wu Gong Yi have passed away, but they remain a great inspiration for us all. They not only demonstrated that Tai Chi Chuan by itself is a great martial art, but their actions put to utter shame martial artists who took pleasure in continuing to hurt their opponents when it was clear they had won..
You have already said in your book that "If you want to be effective in self-defence you must develop internal force and practise combat applications" (The Complete Book of Tai Chi Chuan, p.64). This seems to mean that Tai Chi Chuan is an absolutely independent martial arts. Could you please explain more? Yes, Tai Chi Chuan is an absolutely independent martial art. By itself, absolutely without having to take anything whatsoever from outside -- like taking warm-up exercises from the West, chi kung exercises from other chi kung types, fighting techniques from other martial arts -- Tai Chi Chuan is exceedingly effective for fighting. More than this, Tai Chi Chuan is a comprehensive programme for physical, emotional, mental and spiritual development. It is complete by itself. By practising just Tai Chi Chuan, without having to add anything from outside, one can be radiantly healthy, emotional calm, mentally fresh and may attain the highest spiritual fulfilment. It may sound too good to be true, and it would sound impossible to those who practise only Tai Chi dance, but it is true. I'm trying to take up a self-defence art and considering Taijichuan as an option. Is it good to take up Chen Jia Taiji or is a more "external" form better? Is Taijichuan an adequate form of self defence compared to other arts? And how do you go about looking for a good Taiji sifu? Taijiquan is an excellent option. If you pay more emphasis on self-defence, Chen Jia Taijiquan (Chen Style Taijiquan) is generally the best choice. But other styles, so long as they are real Taijiquan, are also exceedingly effective for self-defence, as you can read in some of the questions and answers above. There is no such a thing as an "external form Taijiquan". If it has only external form but no internal aspects, it is not real Taijiquan; it may be Taiji dance. You should go about looking for a good Taijiquan sifu in a humble, determined manner. The first thing you have to find out is whether he teaches real Taijiquan (which will include, among other things, training for internal force and combat efficiency). He will not be easy to find; be aware that many teachers may be well known and have taught for many years, but they may only teach Taiji external form, not real Taijiquan. Finding a real Taijiquan teacher is difficult enough; getting him to teach you is more difficult. You have to accept the fact that he may have no interest, and certainly no obligation, to teach you even though you may be dying to learn Taijiquan.